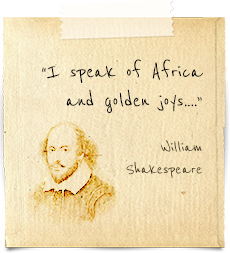 ﻿ Wildplaces Africa. The Finest Accommodation in Uganda's Wildest Places. A safari in Uganda is like visiting ‘Africa in miniature’ – it’s all here. Tangled jungle, glacier-capped mountains, roaring rapids, vast sparkling lakes, terraced hillsides, grassy plains, arid savanna, deep forest…and breathtaking beauty everywhere you look. 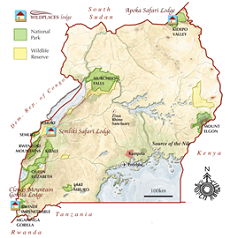 This is a land of contrasts, a geographic showpiece: the Western Rift Valley, the River Nile (the longest in the world! 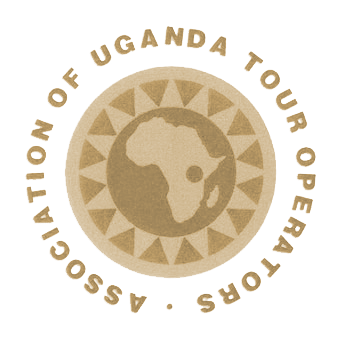 ), Bwindi – the Impenetrable Forest, Lake Victoria, the legendary Rwenzori range – the Mountains of the Moon, the Ituri Forest. In a matter of days you can see some of the world’s rarest creatures: go tracking in the forest to see Gorillas and Chimps, search the marshlands for Shoebill, wander the forest floor following the trail of Forest Elephant, visit a Karamajong tribe or a Batwa (pygmy) village. But it’s not just the rarities people come to see on safari in Uganda. It’s the wildlife typical of East Africa: lion, leopard, giraffe, elephant, buffalo, zebra. It’s the numerous antelope species and the over 1,000 bird species. It’s the smiling faces, the delicious tropical fruit, the sundrenched hills, and the cheerful spirit. It’s the warm days and the cool nights typical of our elevated position on the equator. It’s the fact that a safari in Uganda never ceases to amaze and impress. This is a country worth knowing. And it is definitely worth seeing. At Wildplaces we seek out the pockets of Uganda that still remain wild and secret. In these tracts of glorious wilderness we have built small, fantastically comfortable safari lodges and camps. At our properties you won’t be jostling for space at the buffet table, you won’t be queuing with other vehicles for a glimpse of a lion or a herd of elephants. 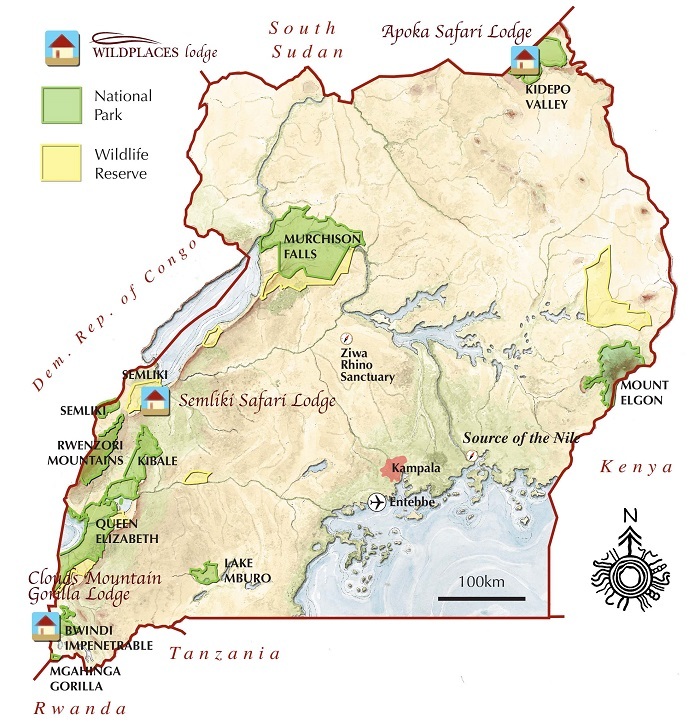 On our safaris you won’t be sharing a car with strangers or slavishly following a pre-determined itinerary. Our award-winning lodges are intimate, private and unique. Service is gentle and discreet. We hire from the local community and are active in building community projects. Everything we do has conservation at its heart.